Graphics prints, stripes, bold belts and a lot more – this upcoming season is full of exciting trends. 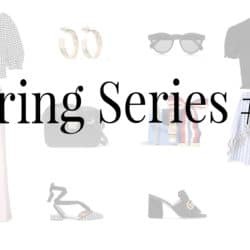 Starting from today, you will find a post with trend updates and styling tips for spring every Tuesday. Let's start this series with a color to keep more than one eye on - it's time for pink! 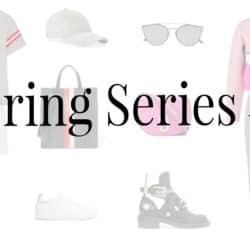 Looking at the collections of Céline, Valentino, Balenciaga or Givenchy, makes it clear that the fashion world is wearing rose-colored glasses this season – and you should definitely do so as well. You can choose whether you go for a shocking pink, a softer bubble gum pink or a deep raspberry tone. Depending on your mood, you can either stick to one tone or mix them up – everything is possible. Regardless of the shade, there is probably no other color which spreads those good vibes as much as pink does. And it seems like everyone can need some of those feelings right now. Especially when you have a look at the political disorders or the increasing refugee crisis. Pink should be a reminder to the good things in life. It should motivate you to keep them up or to do even better. It seems like this mood could help solving those global problems because what this world really needs is more motivation and creativity. Just stick to the saying: "Think pink!" 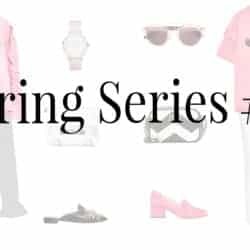 Luckily, there are various ways to style those pink must-haves. 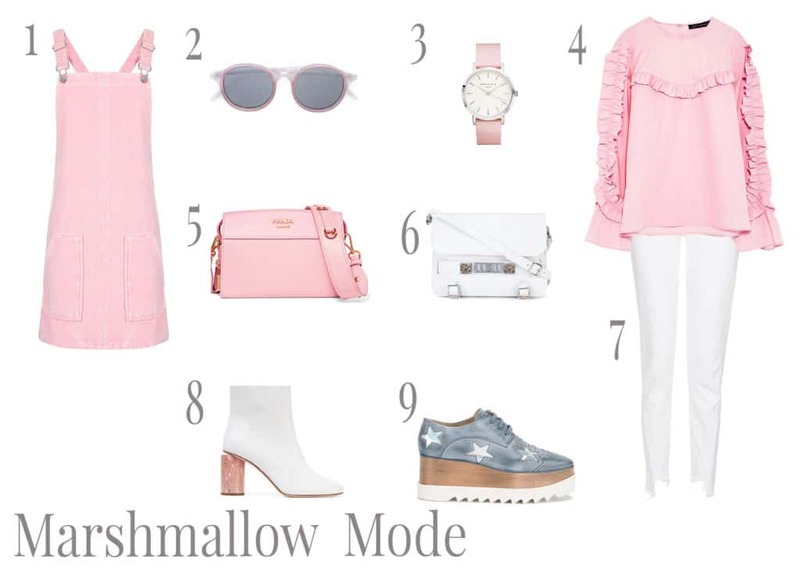 You can choose the sweet marshmallow way in which you pair rose-colored pieces with pastel tones or white. If you are in the mood for a cool and sophisticated combo, go for some accents of black. It will make your outfit look strong and classy. Above all, the rose-colored glasses are your most important accessories – appreciate the good things and take them as a motivation to color the world a bit more pink. Posted in Trendy Tuesday and tagged Accessories, Fashion, Inspiration, Lifestyle, Musthaves, Pink, Spring Summer 17, Style, Things to love, Trend, Trends. Bookmark the permalink. tolle Inspo…vorallem die Taschen sind top! Oh ich liebe liebe liebe Rosa. 🙂 Die erste Collage gefällt mir komplett. Eine sehr tolle Auswahl hast du da getroffen. Such a great round up! I love the ruffles! I’m a huge lover of pink and agree that it’s such a fun color that makes everyone happy! I think I need that ruffled sweater and the pink watch! I love all your picks! I’m a huge fan of the color pink so this shopping list is perfect for me. Das freut mich liebe Olga! Love those picks! I’m so happy everyone is wearing their rose glasses though because blush pink is one of my favorite colors and I’ve gotten so much more of it this season! Just followed you on Instagram! I’m @chessabond! Love your feed!! Pink is such a lovely and lively color, I love it for this time of year. It brings a bit of color to these gloomy winter days! Ein super schöner Post ! Oh that sounds like a great idea dear! mit deinen wundervollen Collagen versprühst du auf jeden Fall positive Energie! Und das können wir in dieser doch teilweise unruhigen Zeit sehr gut brauchen. Mir gefallen die Stella McCartney Schuhe so wahnsinnig gut! Ich wollte sie mir ja eigentlich schon lange einmal kaufen, aber man kann ja nicht alles haben und ich habe in letzter Zeit schon sehr viel gegönnt. Oh das freut mich sehr liebe Jasmin! Da hast du absolut recht, dann kann man sich auch wieder mehr freuen! Thank you so much dear! I am glad you like both of the boards <3 Have a great weekend too!